Yo Arielle and Marcia, you recognize this? 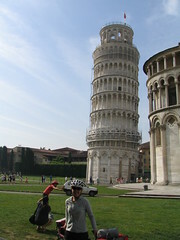 I biked north from Livorno to Pisa, which was only about 30 km away. In 2004, I visited Pisa with my friends. I didn’t think that four years later I would be coming back with my bicycle. Then I headed north. I was really glad to have gotten such an early start, because of the heat. 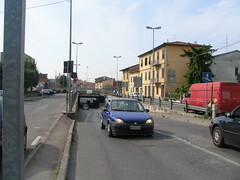 The road heading out of Pisa had no shoulder (none of the roads in Italy have a shoulder), there were a lot of trucks and cars that passed at speed, and it smelled of warm camembert cheese. But it was flat and shady so not all bad. I stopped at this gas station and sat down for water. It was a while before I realized that there was a FULL BAR with hard liquor and everything. I feel really safe riding on these roads. Then I continued heading north, trying to make it to La Spezia, where Cinque terre is. 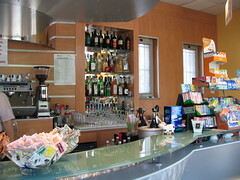 I found a tourist info place and the guy recommended that I camp in another town b-c there is no caming in Cinque Terre. I stopped around 4 and tried to ride up to Cinque Terre, but had to turn around before I got there. I don’t want to ride on the roads when its dark because they’re windy with no lights. It was a long day. I was on the bike for about 14 hours. When I got back to the campsite, I fell asleep before the sun even set. 147 KM!!! Is that the furthest you’ve gone in a day? That’s about 91.64603714303513 miles, by my calculations. And 52.25 kph is about 32.47 mph; pretty fast. Do you still have the bike light I got you? Are you using the bike computer I got you… I’m shopping around and want to know what you like. Wow!! Yeah that is kinda crazy…I’m pretty sure you can make it up those Pisa stairs now, no heavy breathing! Damn yo. Ma Brook Ketherenn in the parliance of the language I am surrounded by. Possibly….